Embrace the flavors of fall and make a decadent restaurant-quality flatbread in minutes! 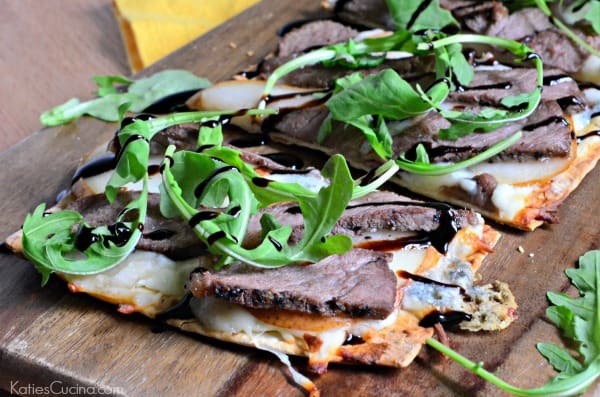 This Steak, Pear, and Gorgonzola Flatbread makes for a great lunch! I think I mentioned last month that I’m starting to become a carnivore. I crave steak… like weekly. Which is so not like me. I’ve never in my life craved meat like I do now. I really think it’s because I’m still breastfeeding my baby. They say your body craves what it needs and apparently I need protein and iron! My family and I wonder if I will continue to crave meat like I have been after I’m done breast feeding or if I will go back to my old vegetarian loving ways. Only time will tell, I guess. If we don’t go out to eat on a Saturday night, I typically make steaks at home for us. I actually had half my steak leftover and I instantly knew I wanted to make a flatbread out of it. I love flatbreads. Flatbreads simply make for the perfect lunch, in my opinion! I worked on some client projects last month and that left me with some gorgonzola cheese. I never have gorgonzola on hand, so I knew I wanted to pair that with my steak and what better to pear steak and gorgonzola with than a little pear. I always seem to start my flatbreads with a little cream cheese. It just gives the flatbread the extra creamy-cheesiness that I think every flatbread should have! So if you have some leftover steak, or maybe you are just hankering for a steak flatbread. I promise you– you will love this recipe for Steak, Pear, and Gorgonzola Flatbread. Embrace the flavors of fall and make a decadent restaurant-quality flatbread in minutes! 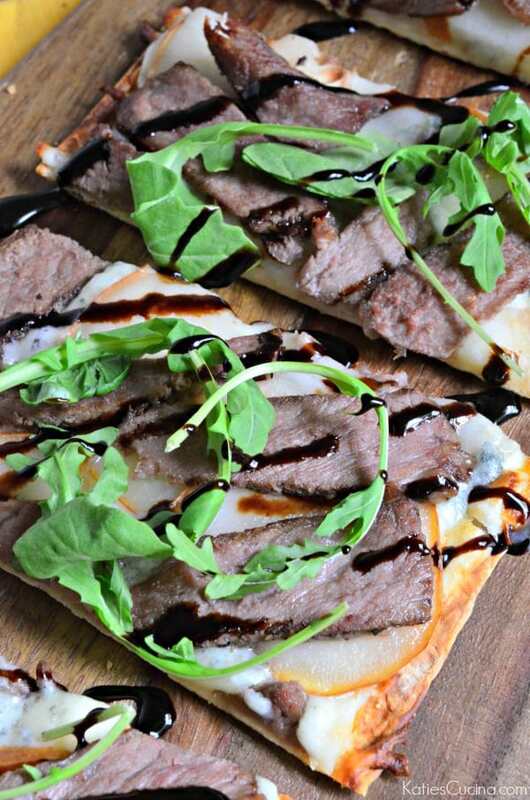 This Steak Pear and Gorgonzola Flatbread makes for a great lunch! Preheat oven to 400 degrees farenheit. Prebake the flatbread for 2 minutes. Then spread cream cheese on flatbread followed by shredded mozzarella and crumbled gorgonzola. Place pears and steak on top of cheese. Bake for an additional 5 minutes until golden brown. 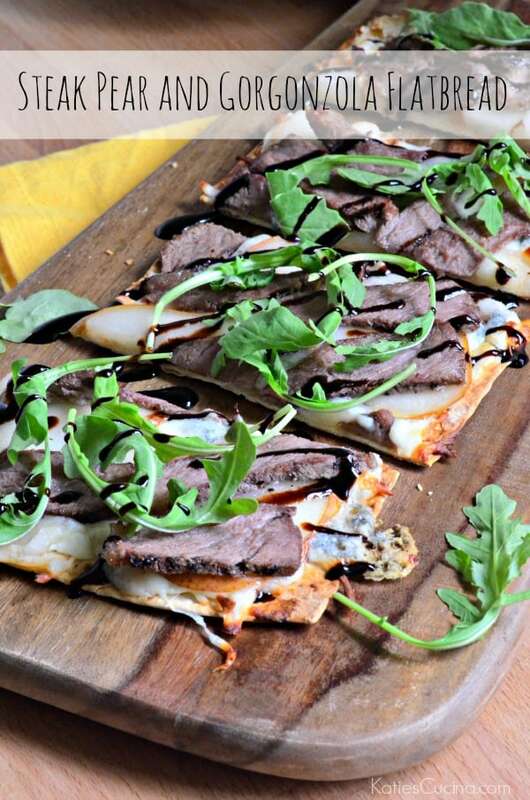 Remove the flatbread from the oven, top with arugula and drizzle balsamic glaze on top. Enjoy immediately. What a great combination of flavors. Good for you for listening to your body!